In young children, chickenpox usually begins with rash, a low-grade fever, and general malaise. In adults, a fever, chills, malaise, headache, and possibly, sore throat appear 2 or 3 days before the rash. 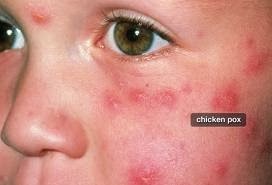 Chickenpox is usually more severe in adults. The rash appears first on the face and scalp, then on the trunk, and then on the arms and legs. The very itchy blisters initially appear like water drops on a pink base. New blisters appear as older ones form scabs and heal. The scabs resolve in 1 to 3 weeks, usually without scarring. Once all the lesions are crusted over, the virus is no longer contagious. Complications are rare and include pneumonia and nervous system involvement. The first symptoms of shingles (zoster) are usually pain, burning, and discomfort in the area of nerve distribution. This pain can vary from mild to severe and generally precedes rash eruption by several days. The rash is usually manifests as a band-like eruption on one side of the body. Redness in the area develops first, followed by bumps that rapidly become water blisters filled with pus. The lesions scab over and heal in about a week. Persistent, severe pain after the rash has subsided, called postherpetic neuralgia, occurs in 10–15 percent of cases and is common in the elderly. Chickenpox and shingles are diagnosed by clinical examination and symptoms. Although not routine, definitive diagnosis of varicella-zoster virus can be obtained by culturing infected cells. Acetaminophen. Patients with chickenpox do not have to stay in bed unless fever and flu symptoms are severe. To relieve discomfort, a child can take acetaminophen (Tylenol), with doses determined by the doctor. A child should never be given aspirin, or medications containing aspirin, as aspirin increases the risk for a dangerous condition called Reye syndrome. Soothing Baths. Frequent baths are particularly helpful in relieving itching, when used with preparations of finely ground (colloidal) oatmeal. Commercial preparations (Aveeno) are available in drugstores, or one can be made at home by grinding or blending dry oatmeal into a fine powder. Use about 2 cups per bath. The oatmeal will not dissolve, and the water will have a scum. Adding baking soda (1/2 - 1 cup) to a bath may also help. Lotions. Patients can apply calamine lotion and similar over-the-counter preparations to the blisters to help dry them out and soothe the skin. Antihistamines. For severe itching, diphenhydramine (Benadryl) is useful and may help children sleep. Preventing Scratching. Small children may have to wear mittens so that they don't scratch the blisters and cause a secondary infection. All patients with varicella, including adults, should have their nails trimmed short.